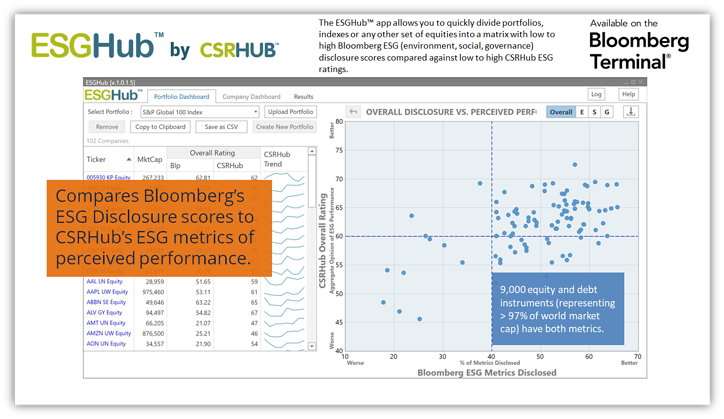 ESGHub connects and compares Bloomberg® ESG Metrics with CSRHub’s ratings on 9,000 companies. Asset owners and analysts use the tool to select instruments for new portfolios, examine the ESG risks in existing portfolios, and discover new investment opportunities. Company managers and researchers use ESGHub to benchmark peers, analyze an industry or supply chain, and look for trends in company performance. If you have a Bloomberg Terminal you can try ESGHub for one month, free. Enter “APPS ESGH <GO>” to trial the app and use it to analyze the environmental, social, and governance (ESG) performance of the companies in your portfolios, indexes or other financial instruments. ESGHub users can identify opportunities, upload their own portfolios, drill down to a detailed Company Dashboard view, create lists and export pdfs. 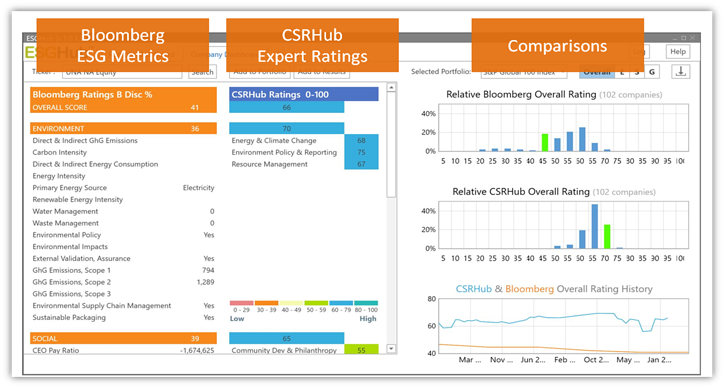 The app generates a matrix using low-to-high Bloomberg ESG disclosure scores compared against low-to-high CSRHub ESG ratings. CSRHub provides access to the world’s largest corporate social responsibility and sustainability ratings and information. It covers over 18,020 companies from 134 industries in 141 countries. By aggregating and normalizing the information from over 617 data sources, CSRHub has created a broad, consistent rating system and a searchable database that links millions of rating elements back to their source. 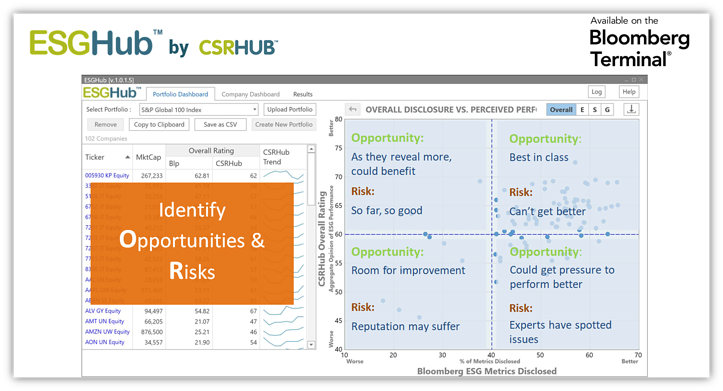 Managers, researchers, API partners and activists use CSRHub to benchmark company performance, learn how stakeholders evaluate company CSR practices, and seek ways to improve corporate sustainability performance. Please let us know if you would like to discuss the new ESGHub app and learn more, by completing the form to the right.